Watch the trailer for The Tree of Life below. 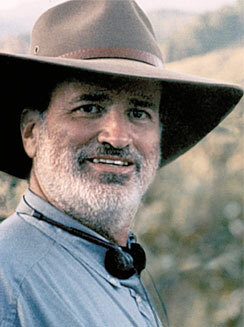 Here’s what we know about Terrence Malick. 1. He doesn’t give interviews, or appear in public and refuses to be photographed, or at least have his photograph used for promotional purposes. Except this one where he wears a big hat. 2. He’s a philosopher. He wrote a book about Heidegger, taught at MIT and spent some time teaching in France. His films have become increasingly ambitious with the years and more self-consciously ‘philosophical’, culminating in The Tree of Life, which takes on nothing less than Life, the Universe and Everything as its subject matter. Add to this the kudos given to an artist who is also something else. Like John Updike working as a doctor in a hospital as well as being a novelist of international repute. 3. He hasn’t made many films. Only five in almost 40 years: Badlands (1973), Days of Heaven (1978), The Thin Red Line (1998), The New World (2005) and The Tree of Life (2011). A work rate that makes Stanley Kubrick look like Woody Allen means each film appears loaded with expectation as an event. It also adds to the mystique of a man who could probably be making a film a year, but who deliberately chooses his subjects with care and then spends time polishing and fiddling. However, each of these points is complicated. Why? 1. The nature of being a recluse these days is defined by an intrusive busy-body media and a promotional sausage-making machine that churns out sound-bites and waffle-snacks. Malick’s reticence is now effectively more voluble than Quentin Tarantino’s mouth, standing as a little pocket of stubborn silence in contrast to the twittering overload of the blogosphere. Shutting up has become the new way of saying something, the way not being on Facebook says much more than being on Facebook. 2. The philosopher tag combines with the recluse label in giving Malick an otherworldly feel. It is a kind of back-handed compliment that promotes to dismiss. Ultimately, Malick is as much a historian as he is a philosopher. All of his films have been period pieces and three of them are based on true events: Badlands is a true crime flick, The Thin Red Line is based on the battle of Guadalcanal and The New World is an interrogation of the foundational myths of European America. 3. Although it is indisputable that his output has been limited, each film has resolutely carved its place into cinema history. There are filmmakers who have made more films, certainly, but there aren’t many who have created more masterpieces. Taken together, Malick’s films create a remarkably consistent universe. A river runs through all his films. There is always a birdcage. A fire burns in every one of his films, usually burning down a house, usually deliberately ignited. Life is lived outside and houses are often foreign environments, to be invaded. The intrusion into somebody else’s house happens in every film. If the furniture of his cinematic universe is consistent, so is his way of viewing it. In fact, Malick’s style is so recognisable as to veer occasionally towards becoming his own cliché, especially in his later films: the magic hour photography, the use of music and the dislocation of image from sound, often dropping the sound out of scenes that look noisy; the use of voice-over rather than dialogue. Initially, the voice-over was an ironic counterpoint. Sissy Spacek’s massively unreliable narrator provided a disingenuous commentary to the inarticulate violence and loquacious double-speak of Martin Sheen’s Kit. In Days of Heaven, the commentary luxuriates in its own meandering irrelevance, giving the film some of its most memorable lines: ‘he wasn’t a bad man: you give him a flower and he’d keep it forever’. The Thin Red Line is an oratorio of questions, anxiety and uncertainty. The voice-over in The New World and The Tree of Life triumphs as a mixture of meditation, introspection and prayer – whispered, sighing, internal mutterings – almost entirely does away with the traditional dialogue-rich scene. Despite diverse subject matter (juvenile crime, poverty, war, colonisation and grief), Malick’s films share some big themes. The loss of innocence is often cited as a central concern in all the films, but innocence is a sticky topic. In Badlands, Holly’s innocence facilitates Kit’s violence, who is in his own way untouched and innocent of the pain he causes. Days of Heaven begins with the protagonist Bill (Richard Gere) launching a possibly fatal attack against his foreman. The paradise of the opening of The Thin Red Line is a truant paradise, preceded by the lurking crocodile and one that, we later learn, exists only via an act of wilful deafness and blindness. John Smith begins The New World in chains and the indigenous peoples are warlike and intent on murdering him. Innocence is then something that we feel the loss of without ever having fully understood its presence. The Tree of Life begins with loss and grief. A grown son, a middle child, perhaps as a result of a war, has died. The rest of the film is an attempt to understand life through the lens of absence, loss and death. The fifty-minute symphonic opening abandons narrative in favour of a mapping of the origins of all life from the cosmic to the microscopic and finally to the human scale. This is certainly Malick the philosopher, but it is also Malick the historian going back to primary sources, and Malick the scientist. Theological ideas, such as that of a lost Eden, give the film images to work with, just as the quotation from Job sets an overtly religious tone to the film, but Malick is interested in DNA and evolution as well. In fact, although there is a religious striving throughout the film, God is a presence that can only be felt through a series of absences. There might be prayers in the films, but whether they are answered or not is open to question. In the cosmic vastness, there is a big God-shaped hole, fringed with doubt and questioning. And yet for all the philosophy, theology, etc., Malick is always grounded. This might seem like an odd claim, when viewing the visual poetry that at times is almost overwhelming, but his films can only get to the spiritual via the intensely physical. The sudden sunshine on a waterfall looks magical, but it is real. The upside down shadows of children playing on wet tarmac might make us think of ghosts, and in a way they are, being the projections of projections of projections, but they are also the shadows of the children. The magic hour is just a certain time of day, albeit a time of day when we feel that something is going, has almost gone, is gone. Just as The Thin Red Line, for all its questions and despair, included a thoroughly delineated combat operation, so The Tree of Life always comes back to a young family in 1950s Texas over which the shadow of a death foretold falls. Even more than the pyrotechnics of the opening and closing sequence, it is this intimate portrait of an ordinary childhood that achieves moments of sublime cinema. The ordinary is elevated, tinged though it is with the elegiac. Two children trying to touch hands through the glass of the window anticipates a moment of final separation. When the children leap from their bicycles and run into the long grass the camera follows them joyfully. Even here, among the games and the energy of youth, Malick is not going to give us an untroubled innocence though. There is sexual awakening, the heartbreaking realisation of parental fallibility and the banal cruelty of siblings. In a sly self-reference, the first word the baby pronounces is ‘alligator’, reminding us of The Thin Red Line‘s very first image: a crocodile slipping under the water. The Tree of Life is Malick’s most magical film, in being his most grounded.